Mother Nature gave us a gift of unseasonable warmth for our WHD Dance filming yesterday. It was beautifully sunny at Yoyogi – everyone took off their coats and danced for almost two hours while we shot several takes. I woke with laryngitis and aching lungs from a theatre workshop the day before, so I could neither lead nor follow. I am extremely grateful to Kana, who listened to my whispers and voiced them in two languages, and Ayumi who jumped in and got everyone rehearsed and drilled. Rob took charge of getting the right shots. I stood back and scribbled messages in my notebook. Thank you to everyone who read my notes and understood my terrible handwriting. Rob says the raw footage looks good. I will edit it into a proper video to share later this week. Jesse’s fun panorama pictures look great. Visiting hooper Grace brought a friend along to photograph the event and I hope we’ll see those pictures soon. 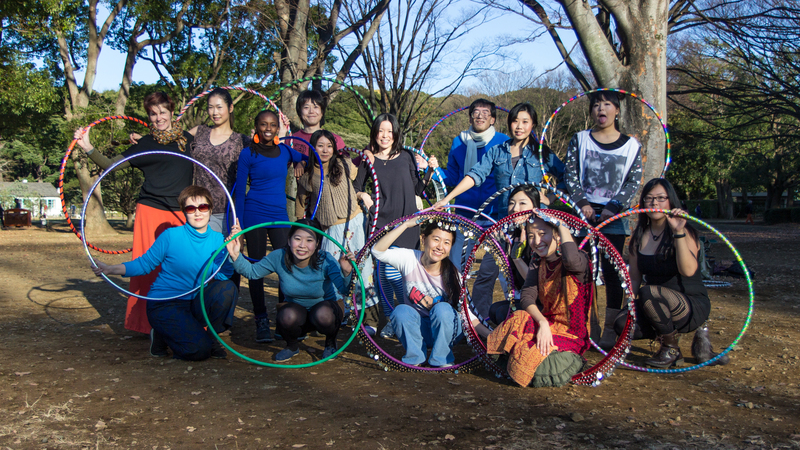 Beautiful day, beautiful hoopers! Thank you all so much for joining in. I was sorry to miss it. I hope you are feeling better Tink.